STUDY | Spend the week studying 1 Peter 2:4–10. Consult the commentary provided and any additional study tools to enhance your preparation. LANDING POINT | Christ makes me enough because of who He is and what He did for me. Each of us is on a quest for affirmation. We spend countless hours trying to attain it. We work late hours in the office, go to the gym, stay up late studying for that final and count our calories. We try to impress others with our personality and accolades. We want to believe we are truly enough in someone’s eyes. Do you ever feel insufficient when comparing yourself to others? Does it feel like everyone else has it all together and it’s only a matter of time before they find out you’re a fraud? Does it seem like others are living their best life and you’re struggling to get through life? If you can relate to any of those questions, know that you’re not alone. This week your group will look at some encouraging words from Peter that explain how Christ makes you enough because of who He is and what He did for you. Q: What does it feel like to be affirmed by someone? Q: What are some things you do or say when you are seeking someone’s affirmation? In 1 Peter 1, Peter writes about the new birth and transformation believers go through after putting their faith in Christ. He paints a grand view of God’s salvation and explains how believers have been brought into God’s family and given a new identity. Through Christ they have become enough in God’s eyes. Because of their salvation in Christ, believers have become God’s temple, according to 1 Peter 2. In the Old Testament, God’s people approached Him through the temple by way of priests and sacrifices. But Christ fulfilled that system. Jesus is the living stone that became the cornerstone of God’s temple through His suffering, death and resurrection. Like Christ, believers are living stones God is using to make a new temple (“a spiritual house”) where His Spirit can dwell. Since Christ became the once-for-all sacrifice for our sins, Christians no longer need a priest to access God. Instead, they have become priests and can go directly to Him. Now believers offer “spiritual sacrifices” to God through their life and worship. God the Father gladly accepts these sacrifices because of His Son, Jesus’s, sacrifice. Read: 1 Peter 2:4–10. What does it mean for Christ to be the foundation (or cornerstone) of your life? What might that look like in everyday life? Q: Having direct access to God means you don’t have to go through someone to be with Him. Though we don’t have priests today, we are sometimes content to approach God or His Word through someone else via sermons, podcasts and other forms of teaching. How often do you take advantage of your ability to go straight to God? At the time Peter wrote his letter, becoming a Christian very likely opened someone up to ridicule or rejection. This persecution might have tempted some to feel ashamed for choosing Christ. But Peter tells his readers they have no reason to feel ashamed, because they believe in the one Person who is most worthy of worship and honor. Despite their suffering, God is pleased with them and will honor them for their faith. Peter then contrasts his original audience’s faith with the unbelief of those who reject them and reject Christ. These unbelievers are like a person stumbling in the dark. They miss the saving truth of the gospel. But believers have been brought out of the darkness and into the light. God chose them to become royalty as sons and daughters of the King. They are now priests in a holy nation who belong to and are treasured by God. Q: Have you ever felt ashamed of your faith? What lie(s) were you believing that led you there? What is the truth that demonstrates you have nothing to be ashamed of? Q: What does it mean to treasure something or someone? Do your thoughts and actions demonstrate a belief that you are treasured by God? What might that look like? Select 2-3 questions from this section to answer. God designed you to be enough. You were created to be flawless and adequate in every way. Of course, sin changed things. Because of our fallen nature, we are daily reminded of our flaws, and we feel inadequate, especially after failing or making mistakes. The Bible gives us the honest truth about our situation. Apart from Christ, we aren’t enough, plain and simple. Sin makes us flawed and inadequate before God. However, there is hope in the gospel. If you want to be enough, you first have to admit that you aren’t enough on your own. Only Christ is. 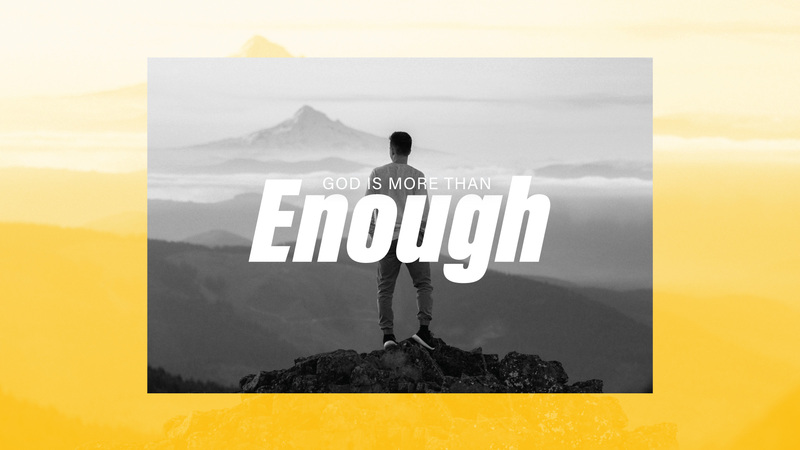 Trust that He is enough and that He came to make you enough. He lived the sinless life you couldn’t live and died the death you deserved to die so you could receive God’s mercy and become a child of the light (1 Thessalonians 5:5). Q: What makes you feel flawed or inadequate? Do your thoughts about yourself reinforce those feelings? What Bible verses could you memorize to help you combat those negative feelings? Q: Why is admitting that you aren’t enough on your own necessary to be saved through Christ? Why is it so hard to admit we aren’t enough? According to 1 Peter 2:9–10, you have no reason to feel ashamed or doubt that you are enough. If you are in Christ, you are enough in God’s eyes—and that’s all that matters. You are chosen. God chose you to be His son or daughter. You are enough because God loves you and chose you. You are royal. You have all the benefits and privileges of being a child of the King. You have direct access to God the Father through His Son. You have the Holy Spirit to help you live like Christ. You are enough because you are a child of the King. You are holy. You have been set apart by God and have His presence and favor. You are enough because God declares you holy in His sight. You are God’s. You belong to God. You are a child of the Father. He works in your life to guide you and grow you. You are enough because you belong to God and are treasured by Him. Q: How would you live if you truly believed you are enough in God’s eyes? Q: How have you experienced God’s presence and favor in your life recently? How did that make you feel? Select 1 question from this section to ask your group. A priest’s role is to represent God before others and represent others before God. Since you are a a priest in the kingdom of God, think of practical ways you can use your mouth and hands to proclaim the excellencies of Christ— how He is wonderful, beautiful and mighty to save. Perhaps you could be intentional about turning conversations towards topics of eternal value. You might share with others about your relationship with God and how He has changed you. You can share the story of Jesus (the gospel) with others. When someone is struggling or needs help, point them to God’s Word. Listen to them, care for their needs and intercede for them in prayer like Christ does for you. Q: What’s one thing you can start doing to be a priest for Christ with others? Q: Write down the name of someone who needs prayer and commit to pray for them over the next week. Spend time sharing a word or phrase that declares the excellence of Christ and who He is and what He has done in your life. Speak against thoughts of inadequacy and shame and declare that you are enough in Christ. Thank God that you are enough in Christ. Read Romans 8:12–39 and reflect on the benefits of being a child of God. Ask the group to share any stories or lessons learned where they see God at work in their lives. Has anything happened as a result of their praying for someone? Peter quotes Psalm 118:22–23; Isaiah 8:14–15 and 28:16 to illustrate how Christ is the chief cornerstone of God’s temple. 1. Douglas J. Moo, “The Letters and Revelation,” in NIV Zondervan Study Bible: Built on the Truth of Scripture and Centered on the Gospel Message, ed. D. A. Carson (Grand Rapids, MI: Zondervan, 2015), 2542. 2. Daryl J. Charles, “1 Peter,” in The Expositor’s Bible Commentary: Hebrews–Revelation (Revised Edition), ed. Tremper Longman III and David E. Garland, vol. 13 (Grand Rapids, MI: Zondervan, 2006), 316. 3. Warren W. Wiersbe, The Bible Exposition Commentary, vol. 2 (Wheaton, IL: Victor Books, 1996), 402.